In a recent essay for the Wall Street Journal, author Paul Tough summarizes evidence presented, with increasing frequency, by experts and researchers in diverse fields (from neuroscience to economics) that will cause many parents to heave a huge sigh of relief: Your child’s success as an adult doesn’t hinge on the preschool s/he gets into. Really. 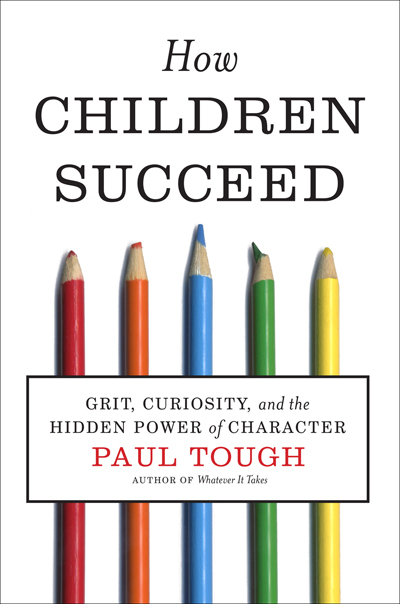 In his recently published book, How Children Succeed: Grit, Curiosity, and the Hidden Power of Character, Tough examines the factors that make a child a successful adult. His Wall Street Journal article explains that the cognitive hypothesis, an idea which states that the kind of intelligence measured by IQ tests is the strongest predictor of success, is logical and comforting to people. It seems so reassuringly simple: A (a high vocabulary, a solid knowledge of math procedures) leads to B (unadulterated, life-long success), and to increase the odds of B occurring, parents need only be sure that A is well in order. This means cramming as much information into children’s heads as possible, and starting young to maximize the time available to do this. However, Tough reports that numerous studies are calling this hypothesis into question. It seems that character, a list of personal qualities that make a person motivated and resilient, is pretty important, too. In fact, Tough believes it might be even more important. Central to this notion is the work of Nobel Prize-winning economist James Heckman, who compared the experiences of holders of GED diplomas (General Educational Development, also called high school equivalency) to the outcomes of high school drop-outs. In theory, the GED holders had the same knowledge base as high school graduates, and it seemed logical that they should have enjoyed the same positive life outcomes. Instead, Heckman found that GED recipients had the same rates of negative outcomes like illegal drug use, divorce, unemployment, and low income as high school drop-outs, despite their good test performance. This result caused him to consider that something more powerful than academic achievement must drive success, and to conclude that the traits which caused GED holders to drop out in the first place were a more important predictor of their futures than their intellectual prowess. Tough suggests that parents need to step back and allow their children to fail (offering a child empathy, one assumes, but not a solution). In fact, he writes that teachers and administrators at high-achieving schools report overly protective parents as their primary concern for students’ well-being. Children work hard and many who attend prestigious schools experience pressure and stress, but their success in life is all but guaranteed. While many parents think they are being kind to their children by shielding them from life’s pitfalls, Tough posits that actually giving a child the chance to face adversity may be the kindest thing a parent can do.